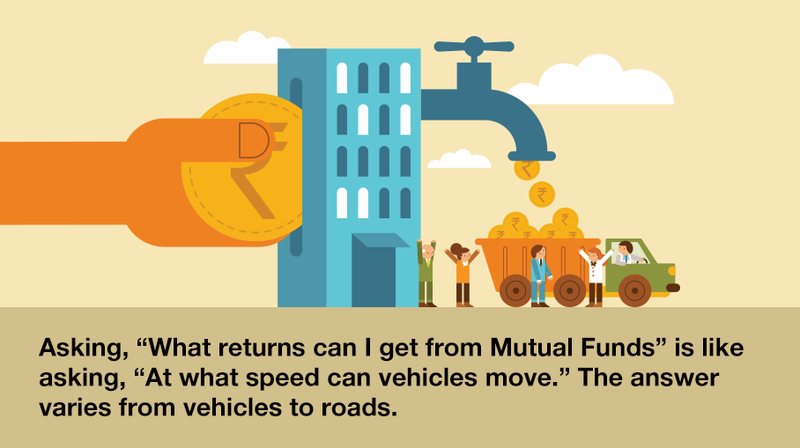 Mutual Funds Returns - What Returns Can Get from Mutual Funds Investment? Imagine asking: At what speed do vehicles run? Can you generalize the answer for the whole category? Different vehicles run at different speeds – even within one category, e.g. cars, while a car made for city roads may run at a certain maximum speed, the one made for racing can run much faster. There is not one product called Mutual Fund, there are many types of different Mutual Funds. The investment returns from the different categories could vary and then there are certain fund categories that exhibit higher level of uncertainty in performance. If the fund invests in a market where prices fluctuate a lot, the Net Asset Value (NAV) of the fund is likely to witness huge fluctuations (e.g. growth funds investing in equity market); however, if it invests in a market where prices do not fluctuate much, the Net Asset Value (NAV) of the fund would be quite stable (e.g. liquid funds investing in money market). In other terms, a liquid fund would exhibit far lower uncertainty in comparison to an equity fund. An investor would be advised to focus on the characteristic nature of the fund and match the same with one’s own requirements.